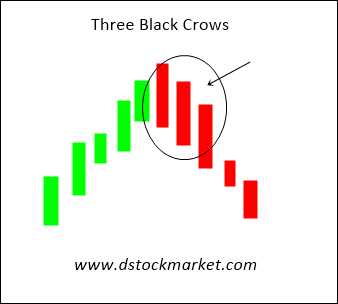 The three black crows candlestick pattern is a bearish reversal pattern that often appear at the end of a bull run. This bearish candle pattern is made up of 3 large bearish bar that closes lower than the previous bar. The diagram above shows how the pattern looks like. The stock will be in an uptrend or has run up quite a lot. Then a bearish candle appears. The next day, another bearish candle appear and closes lower than the previous candle. The 3rd day another bearish candle appears to complete the pattern. The stock will usually drift down and collapse after the pattern appears. 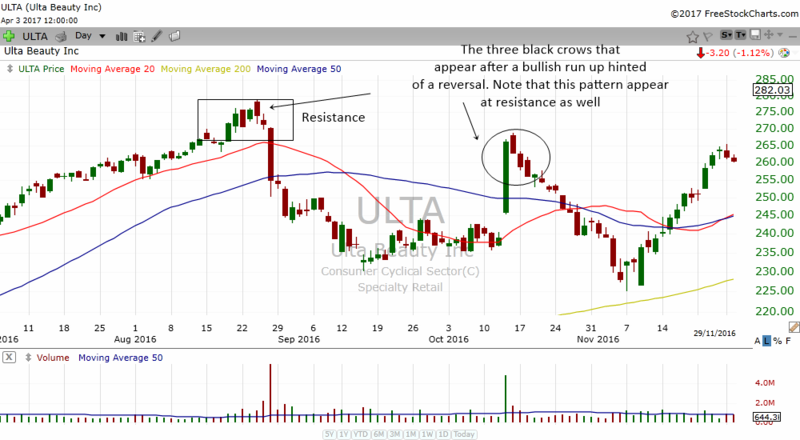 The chart above shows ULTA which had a nice gap up and bullish candle around mid October. Then a bearish candle appeared with another 2 forming and closing below the previous candles. This pattern was completed and look at how the stock drifted lower from there.